Successfully Added DVD Projector - 2000 Lumen, 500:1 Contast Ratio, 800x480 Resolution, Region Free DVD, Built in Speakers to your Shopping Cart. 2000 Lumen (80 ANSI Lumen) and 500:1 contrast ratio for a clear sharp image. 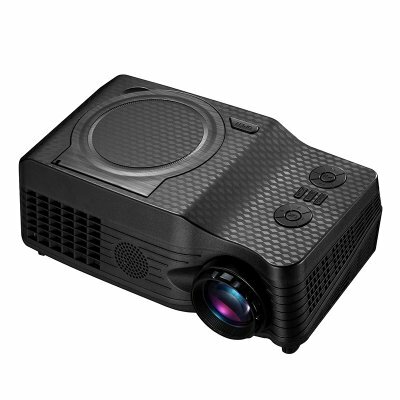 This DVD projector has a 5 inch TFT LCD display and combined with a 2000 lumen lamp brings fantastic projections that can be up to 150 inches across. Now you can play games and watch movies on a larger than life projection with great colors and crisp details that make for an immersive viewing and gaming experience. With inputs for micro SD card, HDMI, AV, USB as well as TV antenna and DVD discs this projector can be used with just about any media player or imaging system. You can hook up games consoles such as Xbox or Playstation and enjoy games in all their detail. Alternatively shares your favorite DVDs, TV shows or movies with family and friends with your home cinema setup. You can even connect this DVD projector to your laptop or desktop PC for presentations in the classroom or office, the possibilities are almost endless. Supporting region-free DVD and CD discs as well as a who spectrum fo file and media formats this projector with its numerous inputs it one of the most versatile systems on the market today. This DVD video projector comes with 12 months warranty, brought to you by the leader in electronic devices as well as wholesale projectors and cool gadgets..